This is an inexpensive intimate meal. Something to have when you don’t want any fuss, to eat while reading a good book on a blustery day. 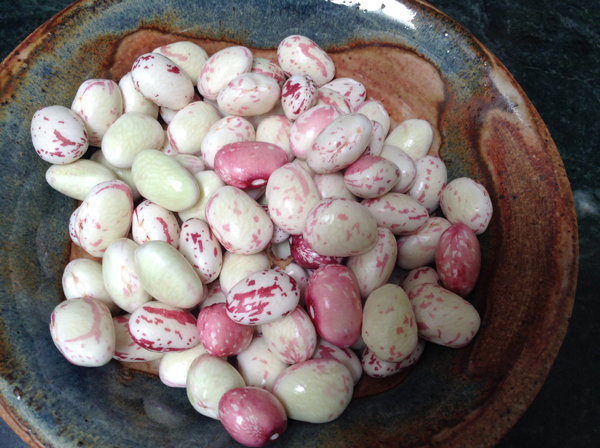 Usually the beans are from a can, the toast a garden variety wheat or white from a plastic bag. 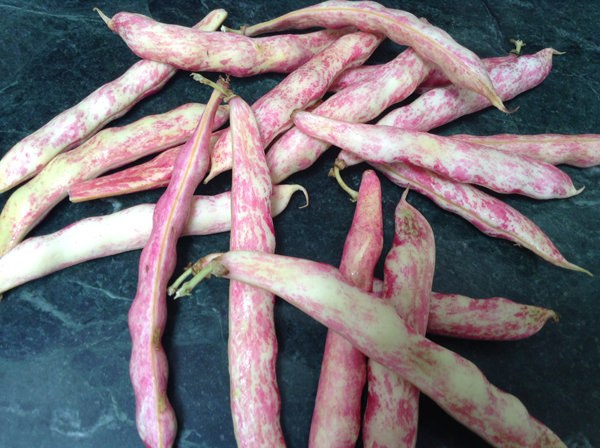 But Tomatero farms had some beautiful Tongue of Fire beans for sale at the last farmers market and I couldn’t resist. Fresh beans are faster and easier to cook than dried beans, so though this is more complicated than opening a can, it’s not that bad. Why for two? Because this is a garlicky dish that should be eaten by those who share a space, otherwise you might find yourself on the couch until the vapors clear. Add the beans, sage, bay, garlic and a good splash of olive oil to a pot with enough water to cover the beans by a few inches. Bring to a light boil, reduce to a gentle simmer and cook for about 45 minutes until tender. 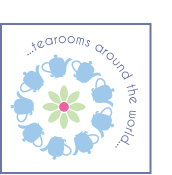 If the water evaporates and leaves the beans uncovered, you can add more hot water from a kettle. Don’t add cold water. Drain the beans. 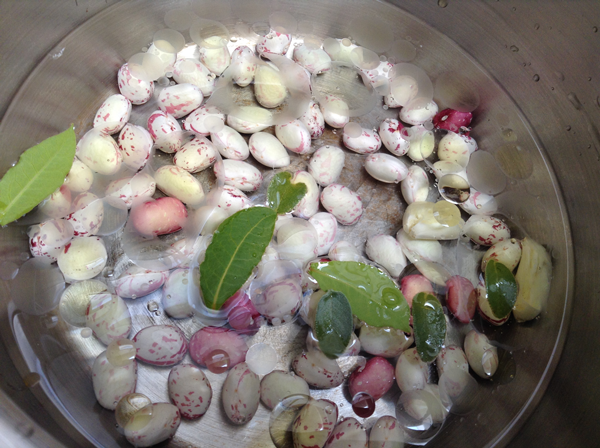 Remove and discard the sage and bay leaves. 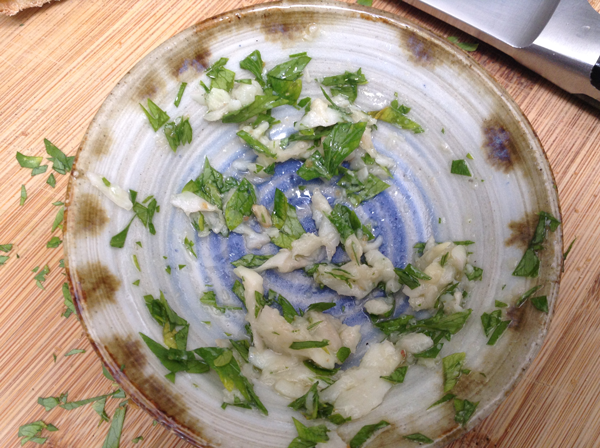 Remove the garlic and in a small bowl mash it with a splash of olive oil, a pinch of salt and half the chopped parsley. The amount of parsley or other herbs you add is up to you. Cut the baguette down the middle and into 4 smaller pieces. You will only need about a third to half a normal baguette. 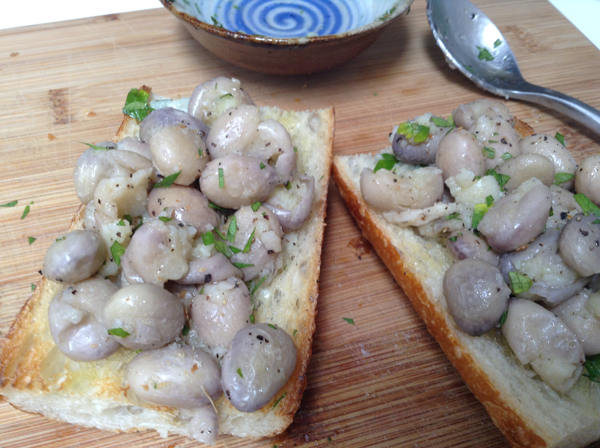 Drizzle the cut sided with a little olive oil and toast–cut side down–in a frying pan until the tips of the bread are golden. 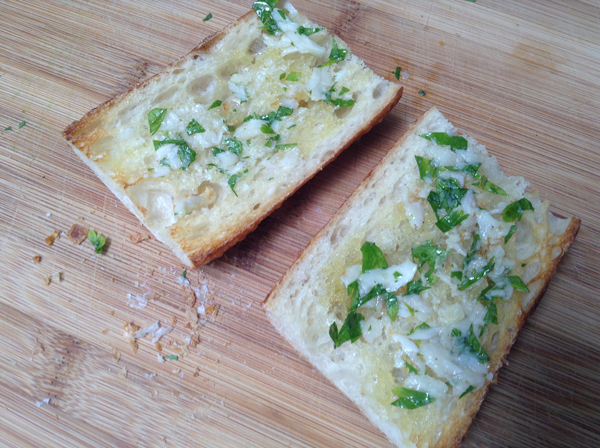 Spread a quarter of the mashed garlic on each piece of bread. Toss the beans with another little splash of oil and freshly ground pepper. I like to mash a few of the beans with a fork to add some texture and to help keep things glued together so the beans don’t go rolling off the bread. Pile the beans on each piece of bread. Sprinkle with parsley and any herbs or herb flowers, and another grind of fresh pepper. These last two steps are optional and to taste. Serve warm or at room temperature. You painted the most wonderful picture in the first two sentences- I want nothing more than beans on toast while I’m curled up reading a book!